Captain Wario is one of Wario's many forms in Wario: Master of Disguise. 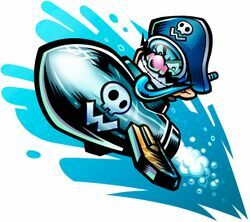 In this form, Wario can row through water in an inner tube, or even go completely underwater in a submarine and shoot torpedoes. However, for Wario to go in the submarine, he must first learn the move separately. In Wario Land: Shake It!, Wario can once again ride in a submarine and shoot torpedoes, but the Subwarine bears no resemblance to Captain Wario's submarine. Also, Wario does not assume a pirate persona. This page was last edited on October 6, 2018, at 08:30.